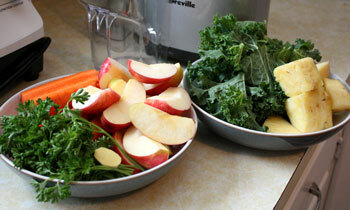 Balance Body & Soul Nutrition // Health Tips Blog // Juicing - Nature’s Multivitamin! Juicing is all the rage these days. My Pinterest and Instagram feeds are being blown up with images of brightly coloured, fresh juices, and I’ve got to tell you, I love it! Any time that people start enthusiastically embracing something healthy, it’s hard not to get excited! As clients continue to navigate the waters of a healthy diet vs. diet fad, I’m getting more questions about how they can incorporate fresh, raw juice into their lives. It’s not hard, and no matter what your health and nutrition goals are, juicing veggies and fruits can definitely be a part of your plan. Before we go any further, however, I beg you not to forget the humble smoothie. Healthy concoctions of fruit, leafy greens, protein, and nutritional superstars like sea veggies, maca, and cacao still make an amazing, portable meal. I’m not asking you to make a choice between juicing and blending because they both have a place on our nutritional plate. While juicing is an incredible way to get a concentrated shot of nutrients, smoothies can offer a complete, balanced meal. Juicing uses a LOT of produce (way more than daily green smoothies), so be prepared for your weekly grocery bill to grow noticeably if you’re juicing at home. 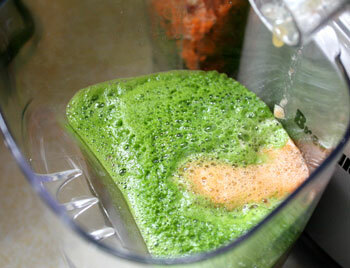 Also, juicing can feel wasteful as you’re left with quite a bit of dry fibre and pulp. Some people add it to muffins and bread, some use it in smoothies, but most toss it in the composter. Having said that, no matter how much spinach or kale you pack into your blender, you’ll never get as many vitamins, minerals, enzymes, and amino acids as you will find in a fresh veggie and fruit juice. Fresh, raw juices are a concentrated shot of nutrients that your body can easily absorb, unhindered by things that slow down the digestive process. If you’re buying a juice in the grocery store, then you can be certain that it has been pasteurized and is lacking the enzymes and nutrients present in huge quantities in the fresh stuff. Pasteurization is a flash heating process that is supposed to kill off bacteria, making things more shelf stable. 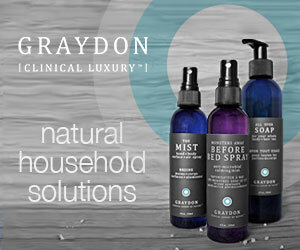 The trouble is, the heat also kills off vitamins, minerals, and other nutrients that are also sensitive to heat. If you want to reap the true benefits of juicing, you’ve got to do it yourself, or purchase it from a reputable fresh juice company. Many people think that juicing means that they need to commit to a multi-day juice cleanse when, in fact, you can do your body a whole lot of good by merely incorporating daily servings of veggie-packed juices to an already healthy diet. You can eat all the salad you want, or add as much kale or spinach as you like to your smoothies, and you’ll never come close to the nutrient density of one serving of fresh juice. It’s an intense hit, and without fibre slowing down the digestive process, these nutrients are easily accessed by the body and absorbed into the system. If you decide to go on a juice fast for a few days, you’re giving your digestive system a break, while still feeding your cells vital nutrients that help with detoxification and healing. I’ve recently started juicing in earnest for my family and I, having finally invested in a juicer. I spent a lot of time weighing the pros and cons of different juicer types and brands before settling on what I wanted. I can definitely tell you that not all juicers are created equally, and if you’re considering purchasing one do your research. Read reviews, and think about what you want, because whether you spend $200 or $400 you don’t want to end up with a machine occupying precious real estate in your kitchen that’s not being used because it frustrates you. Spinning centrifugal juicers tend to be a little less expensive, and while many of them are of high quality and produce great juice, the way that they produce juice has a few down sides. First, because they are spinning at high speeds, they generate heat, which is already starting to degrade the nutrients of the fresh juice. Second, they cannot juice things like wheatgrass, and some models don’t even do a great job of juicing kale and other tougher leafy greens. Single and twin gear masticating style juicers work a bit more slowly, with the gears grinding and pressing the juice out of produce. They really don’t take much time at all to make juice, and their slower speed means that juice can be kept a little longer without losing all the nutrients. They can also handle grasses like wheatgrass, and make short work out of kale and other, dense leafy greens. These are all combinations that my son enjoys as well, and since he also enjoys making the juice, it’s become something fun that we can do together! 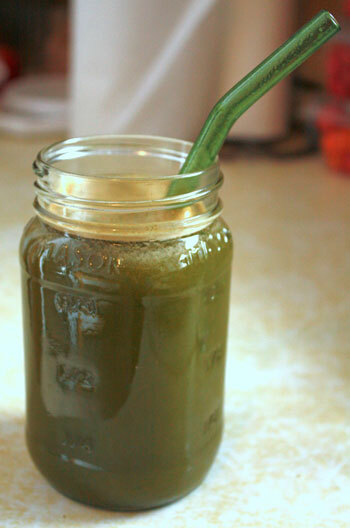 So, if you’re curious about fresh juice, I encourage you to try some! Most major cities have juice bars, or delivery services that create fresh juices, so you don’t even need to commit to juicing at home to enjoy the benefits! Be warned though, once you experience how amazing you feel, you may suddenly find yourself at home juicing up a storm!